On a sunny Sunday afternoon in June, the ladies and I gathered at the Brown Palace for high tea. We had our pretty summer dresses on and arrived to a room filled with roughly 200 gorgeous people looking freshly scrubbed and happy. Our plates were ready, full of adorable tiny sandwiches and sweet petit fours. The tiny purple macaroon immediately caught my eye, topped with a blackberry and a little gold leaf garnish. I was saving that one for last. “I want to nominate you for the Aspire award and I need a bit of information to complete the entry.” my accountant, Beth Ann Bethel, had told me a month before. I’d seen the promotional email from my financial advisor, Laura Rumans, a few weeks prior. 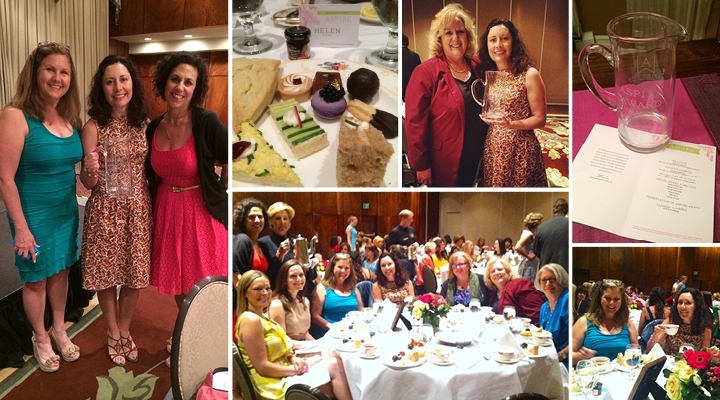 Trilogy Financial Services was planning Aspire: Celebrating Denver’s Women of Distinction. The award recognized women with four key qualities — ambition, perseverance, humility, and influence. I liked those adjectives, but breezed passed it trying to get control of my inbox. A few weeks later, I discovered I was a finalist — one of six women to be honored at the awards ceremony. It was a lovely event. Nick Richtsmeier of Trilogy served as emcee and introduced the keynote Pui Kalyanamitra to kick things off with an entertaining story about her mother’s ambition to provide opportunity for her girls in a freer society. The program continued with three women from different backgrounds sharing their stories about building a business, overcoming obstacles and challenges, opportunities earned, lessons learned, and work-life balance. Each story was unique and had a memorable message or outcome. Then Nick introduced the finalists, describing their achievements and challenges with a surprisingly meaningful and personal delivery. I was really touched to hear him describe my own and each woman’s experiences. This room was hopping with life and passion. Many simple truths rose to the surface during the two hours together sipping Earl Grey and daintily nibbling on cucumber sandwiches. One is that we’re in this together. Each woman’s story was about how she had struggled and found support or had others whom she supported in their struggle. Challenges, success and failure are part of life and growth, whether in health or home or work. Another theme was how defining one’s life on one’s own terms is a large part of being a woman. When work, family and life passions are combined, an infinite number of combinations become available, and we don’t need to fit within a defined role. Most of the women presenting started with an education pointing them in one direction and evolved their careers into something quite different. There was no straight path, no set of predetermined steps. Each woman chose her signature route. The award went to Jolene McKenna; her story was of overcoming challenges, generosity and resilience. I came home with a finalist trophy — an engraved glass pitcher ready for mojito season — and a feeling of empowerment from being surrounded by good energy--both from the sparkling guests who attended and the special women at my table who are both inspiring and supportive. Thank you to Joy Lowe, Cyndi Maupin and Beth Ann (along with Linda and Katherine) and Carla Carwile (there in spirit) for being part of my tribe, now and over the years. They have helped me realize my potential, navigate obstacles, and reach out to others. I may have left that day with a few scones tucked into the trophy box, but what I really took home was that everyone there could be an Aspire winner — which truly is inspiring. And with all those pitchers, that could make for a pretty good party. 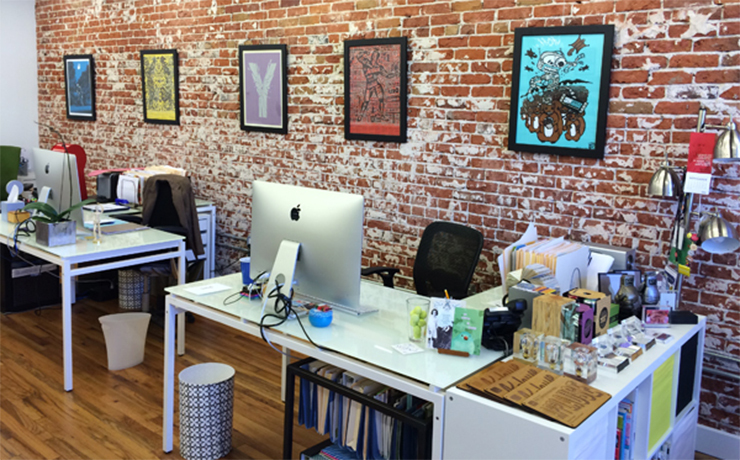 EnZed Design has moved to a new 'hood in Denver—Lower Highland, or “LoHi” to the locals. 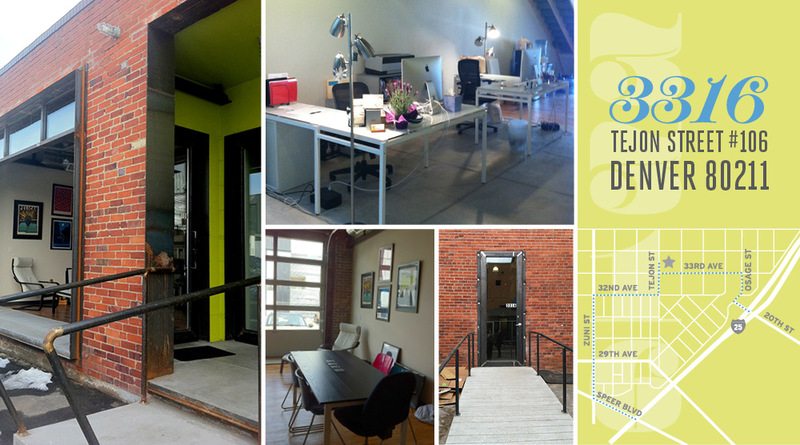 Just zip up I-25 and exit at 20th or Speer North to access our studio located at 3316 Tejon Street. 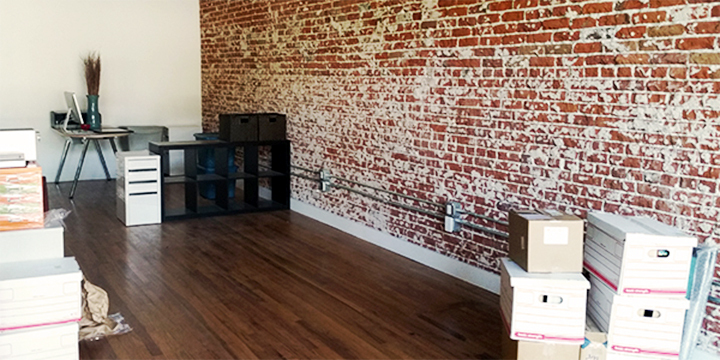 The new space is a converted Rollerdrome that architect Matt Davis renovated into retail space on the street with office bays along the side. Each features an open floor plan, mezzanine level and a garage door in lieu of plate glass windows. He salvaged much of the narrow-plank oak floors and barrel ceilings, then complemented them with industrial finishes such as tall steel doors, exposed brick and concrete block, and translucent walls. Helen and Emily are enjoying the company of several creative firms in Unit 106. 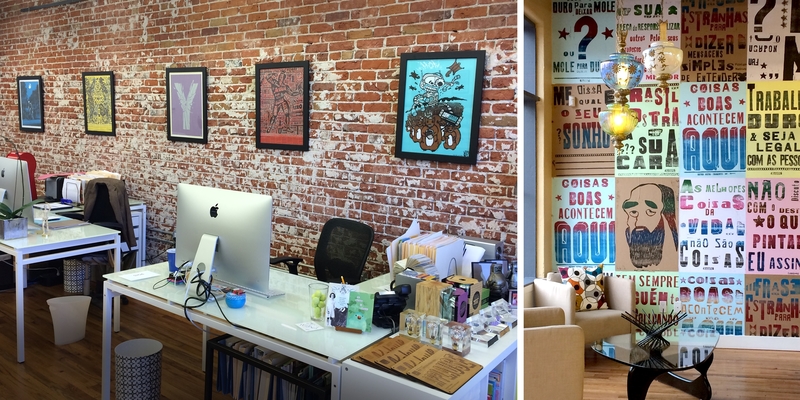 Two webbies— Matt Crest of Artletic and Chris Arnold of Limber Creative—and two print peeps—Jason Wedekind of Genghis Kern and Maura Gauthier of The Paper Guppy—are the primary office mates. And AIGA Colorado president Elysia Syriac of Relish Creative hijacks the conference room for committee meetings when she’s not designing with Jason. We are steps away from two new clients and collaborators, Gränd Salon and Launch Advertising, which makes face-to-face time very easy—and getting those roots touched up a little quicker, too. When we’re not behind our iMacs, we enjoy all the foodie spots in the area, including Old Major, a new restaurant in our building. The mussels are as amazing as bartender Ryan’s mustache. Kitty corner is the recently opened Jezebel’s, if you’re up for crisp fried pickles. Round the corner is old favorite Rosalinda’s for hot green chile. If you keep walking west on Tejon, you’ll bump into the line forming outside of Little Man Ice Cream. 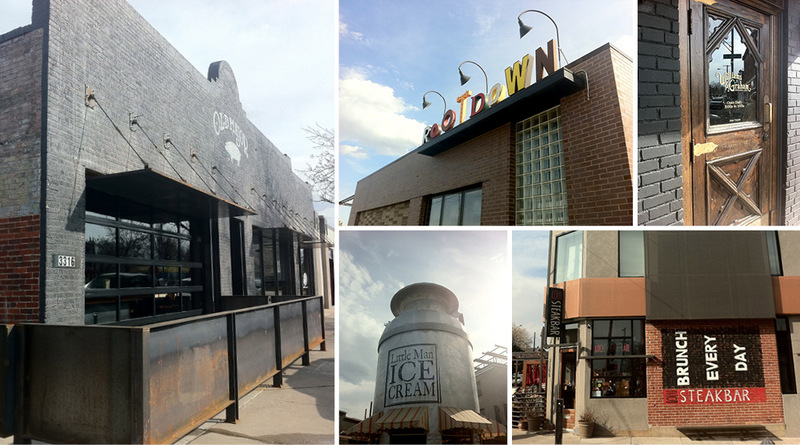 Take a right and you’ve hit Linger, the former Olinger’s repurposed in a delicious way. Swing left and you’ll hear music spilling out of Lola as they mix your custom guacamole. If you venture up 32nd, you’ll find Tony P’s surrounded by tiny race cars ready to deliver. Just a few steps north is the Wooden Spoon Cafe & Bakery for a quick lunch. Duo is on that corner two ... or too. We certainly will not go hungry! If you want to meet for a drink, we can sneak into Williams & Graham without being seen, stop into LoHi Steakbar for a martini, sip a lavendar lemonade on Root Down’s patio, or grab a beer at Ale House at Amato’s, just to name a few. February 25, 2013 - No Comments! 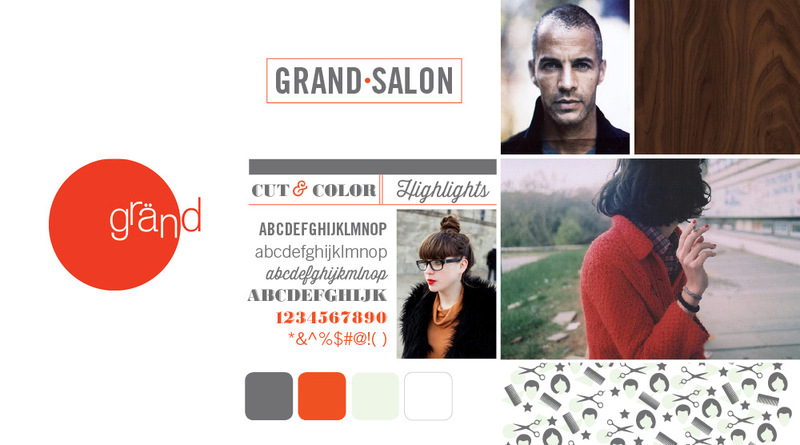 We recently completed a few projects for Gränd Salon that we are excited about and have been eager to share with you all! Gränd Salon, owned by Shelly Rewinkle, moved from their LoDo location to a customize space in LoHi on 35th and Kalamath street. The new building was transformed from an old plant warehouse into an industrial yet zen atmosphere with a larger studio for their stylists, more room for retail, plus spa-like amenities — nail services and reclining shampoo stations. Ahhhhhh. We created a fresh new look for their existing brand to better fit their new space, including a new website, business cards, appointment cards, service cards, and custom emery boards. 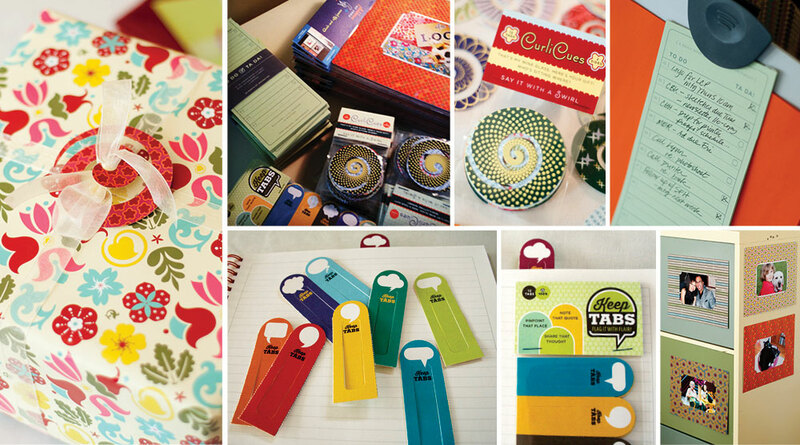 We started out developing a mood board for their brand. We focused on collecting images that were edgy, hip, organic, yet clean and modern to communicate the feel. Then combined the existing red circular logo with new typefaces and natural elements of the interior to establish the look. The mood board set the tone for each element under the brand. The website launched on Jan 11, 2013, opening day at the new studio. We designed, developed and customized the site using a responsive WordPress theme to make it easy for Grand to update it regularly. With the help of Lynn Clark who wrote the copy and used her SEO expertise to optimize it, the site has been an effective tool for announcing the move and introducing the salon to new clients. The site features each stylists with skills listed, enabling clients to search and filter by the service needed and then book an appointment online. Their blog, Mental Note, features salon news and their Killer Deals page offers clients something new to try. The ability to easily change the website allows Gränd to connect their strong Facebook presence and web presence for more effective marketing. The business cards are made of wood! Thanks to Roger at Public Letterpress, each stylist proudly hands a client a wood veneer laser-cut business card. Not only do they look and feel awesome, they smell so good too! This is a business card you certainly wouldn’t toss. We created a matching Services List that details everything Gränd offers as well. For the appointment cards we kept things simple and fun, but still unique. The design is printed in black on kraft paper, but we added a custom rubber stamp to feature the current Killer Deal and provided red pencils for the receptionist to jot down information for the client’s upcoming appointment. Two colors without the cost, but all of the creativity. 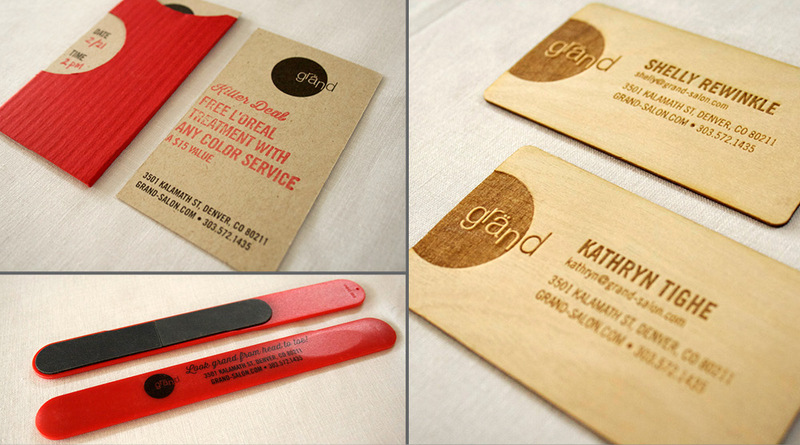 The emery boards proved to be an effective promotion for Gränd Salon’s big move. Each custom nail file was first handed out to clients at their last appointment in LoDo. It served three purposes: announce the new address, allow a sneak peak at the new look, and promote the new nail services. Bonus – it stays in their bag as a Gränd reminder.